Check the length measurements against your own measurements, so that the pattern can be lengthened or shortened accordingly. The sleeve length is particularly important for coats, and designs with cuffs or zips at the wrist. If in doubt about the length, use your vlies pattern piece to check the length. If it does not fit, add or remove a horizontal section in the middle of the sleeve. The length of a jacket or shirt can be vital to the overall look of the design. After determining the length you would like, adjust the pattern by lengthening or shortening it at the waist. If you adjust the length of the jacket or shirt, it will normally be necessary to adjust the position of the pockets. The dress length can me altered at the hem or at the waist, depending on whether the adjustment is needed to the torso or leg length. Check against your own measurements. The length is measured from the crotch down (see figure 2). If the length is wrong, it should be adjusted along line 2.Also check the seat rise (crotch depth) and adjust if necessary along line 1. 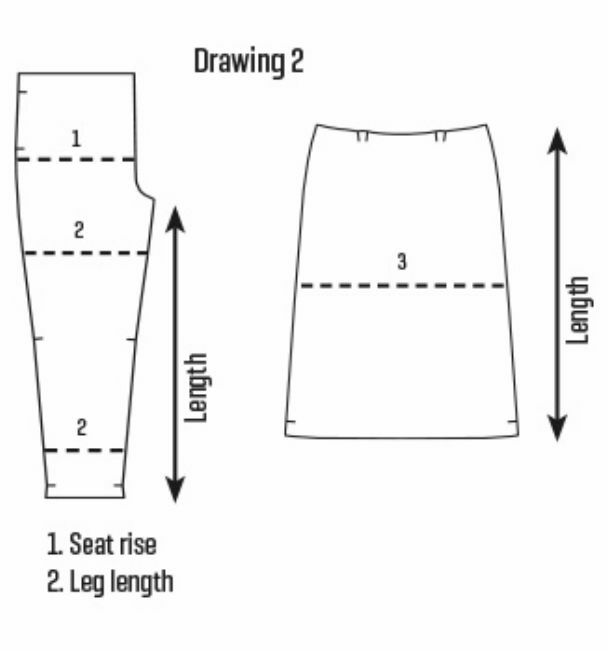 The skirt length is measured as shown in figure 2. Find the length that is most flattering, then adjust the length at the hem of the skirt, or along line 3, depending on the design. 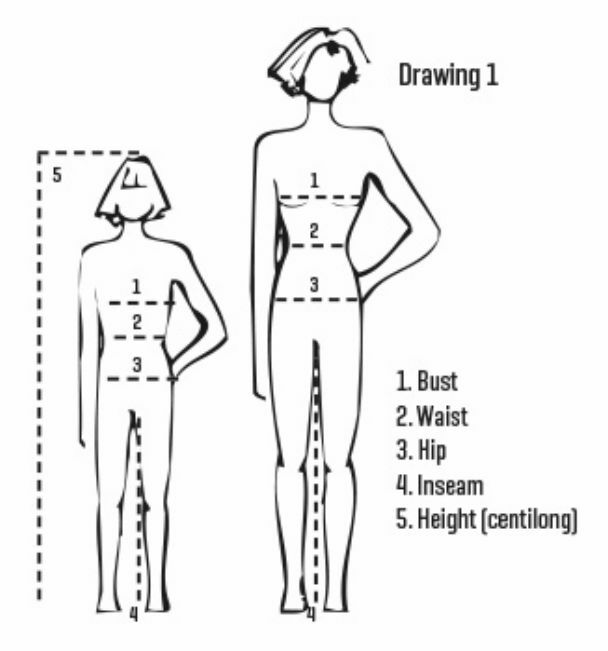 Chest and hip measurements are the most important measurements. The chest is measured at the widest point, with the arms hanging loosely at the side. The hips are measured at the widest point, roughly 20 to 25 cm below the waist. To find the widest point, loosely run the tape measure up and down the widest part of the hip. If you are a size 48 at the chest and a size 52 at the hip, the jacket or dress will fit best if you choose a size 48 and add extra width to the hip on the pattern. For jackets, this is added only to the back and side seams, and for dresses, a little is added to all the seams.